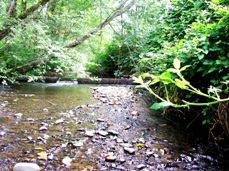 King County has monitored the ecological health of Coal Creek in a variety of ways, including collecting and analyzing water, sediment, and benthic invertebrate samples. Station 0442 is at the former United States Geologic Survey (USGS) gaging station located near Coal Creek Parkway and 119th Avenue South. Water quality samples were collected monthly at this station from 1972 until 2008 when budget cutbacks forced King County to reduce the breadth of its water quality monitoring program. Sampling at this station resumed in February 2013. Sediment quality samples have been collected from Coal Creek since 1987 and Benthic invertebrates have been sampled from various sites in Coal Creek since 2002. From time to time, additional studies have been conducted on Coal Creek. Click here for more information about Special Studies. Coal Creek is located along the southern limit of the City of Bellevue, Washington. The headwaters of Coal Creek originate in the steep terrain of Cougar Mountain at an elevation of about 1,400 feet. The creek flows for about 7 miles through a series of steep, narrow ravines before entering Lake Washington along the eastern shoreline at Newport Shores. The drainage basin for the creek is roughly 4,550 acres and contains one large tributary, Newport Hills Tributary (Tetra Tech/KCM, 2005). The watershed is within the shared jurisdiction of the City of Bellevue, King County, and the City of Newcastle, Washington. Extensive coal mining activities took place in the basin beginning in the late 1800s. The mining activities resulted in changed stream courses, channelized reaches, and mine tailing dumped along stream banks (McDonald, 1987; Kerwin, 2001). Headwater streams of the south fork of Coal Creek originate from a caved-in section of mine that seems to combine with an extensive mine drainage system (Skelly and Loy, 1985). Urban development within the basin in the last century has further altered the creek's natural hydrologic characteristics, increasing the frequency, duration, and peak of flood events, stream bank erosion, and streambed sedimentation (Kerwin, 2001). The channel was diverted southward in the late 1940s, then northward again in the late 1950s because of the construction of an airstrip in the delta area of the stream. In the 1960s, as a feature of the residential development, two large canals were excavated just south of the stream mouth to allow moorage and waterfront amenities for inland properties. The stream has also been crossed several times by large municipal water and sewer mains. A comprehensive basin plan for Coal Creek was produced by King County and the City of Bellevue in 1987 (King County). As part of this planning effort a hydrologic model was developed. It was found that base flows in Coal Creek are augmented by approximately 10% by flows from mine tunnels. Coal Creek was also found to have extensive sedimentation problems from stream bank erosion and the occasional catastrophic failure of tailing slopes that remain from the old coal mining activities in the creek's headwaters and landslides of the steep slopes above the creek. Since 1997, the City of Bellevue has maintained two sediment retention ponds in the system, one immediately upstream of Interstate Highway 405 and another immediately upstream of Coal Creek Parkway. While the sediment ponds are helping to control excessive delta formation through the reduction of large particles, smaller particles and fine silts and clays remain suspended and wash downstream (Tetra Tech/KCM, 2005). Thus the ponds provide no protection for spawning and rearing habitat (Kerwin, 2001). Currently, total land use in the basin is dominated by developed and forestland, whereas agriculture, scrub, and wetlands contribute a very small amount to land use. Developed land is mostly low intensity and open space. There is some medium intensity development, and a small percentage of high intensity. Forestland is mostly mixed and deciduous. Agriculture is entirely pasture/hay. Other land use includes grassland and open water. Grassland, scrub, and wetlands make up the remaining land use in the basin. See Table 1 below for more details on land use. The Coal Creek basin has few returning adult salmon of any species, although substantial supplementation of coho has occurred (King County 2001b, 2001c, April 2005; Kerwin, 2001). The Washington Department of Fish and Wildlife reported planting between 9,000 - 13,800 zero age coho into Coal Creek from 1994 - 1997. Coho, Chinook, sockeye, steelhead, and trout have been noted in the basin (Kerwin, 2001). From 1997 to 2015, volunteers with the Salmon Watcher Program recorded salmon observations at various locations in Coal Creek. Volunteers have consistently saw coho salmon in the creek. Less commonly spotted were Chinook and sockeye salmon. State water quality standards were revised in 2003. Coal Creek is now designated "Core Summer Salmonid Habitat" for aquatic life use and "Extraordinary Contact" for recreational use. As part of the updated water quality standards, the lower portion of Coal creek has been assigned an additional "Supplemental Spawning and Incubation Protection" temperature criteria of 13 °C to be applied from September 15th to May 15th. Coal Creek is on the Washington State Department of Ecology's (Ecology) 303(d) list for violations of DO and bioassessment standards (Category 5). A 36-year (1972 - 2007) trend analysis was conducted with baseflow data collected from Coal Creek. This analysis showed some improvements in the water quality over this time period. Phosphorus, FC bacteria, and total suspended solids have all shown significant decreases. However, instream temperatures increased and DO and pH have decreased significantly during this same time period. A Water Quality Index (WQI) rating system was developed by Ecology that evaluates several water quality parameters and gives a single rating of "high", "moderate", or "low" water quality concern. To view WQI scores for Coal Creek, please visit the Water Quality Index webpage. King County operates two stream gages on Coal Creek: Coal Creek ((06a) and City of Bellevue Coal Creek at Newport Shores flow station (COB_CCF). Sediment data were collected from Coal Creek as part of the Stream Monitoring Program starting in 1987. Data were compiled from 1987 through 2002. Data analysis identified no significant trends for any of the parameters tested. Basin-wide sampling took place in 2007, including four sites along the Coal Creek reach. Concentrations of arsenic at sites A442 and D442 exceeded the Sediment Cleanup Objective (SCO), meaning effects to sediment-dwelling animals are possible, but uncertain. At site A442, concentrations of nickel and bis(2-ethylhexyl)phthalate (a ubiquitous chemical found in many plastics) also exceeded SCO. AVS/SEM analysis suggests that metals were bioavailable at site D442, but not at site A442. For more information about benthic macroinvertebrates and King County’s Benthic Macroinvertebrate Program, please visit the King County Stream Bug Monitoring webpage. To see the benthic macroinvertebrate data for Coal Creek, please visit the Puget Sound Stream Benthos webpage. King County is planning to upgrade a regional sewer line that serves Bellevue and Newcastle. As part of this work, the project team has been doing field work to assess soil and groundwater conditions. This work will help confirm a pipeline path that will reduce impacts to the Coal Creek Natural Area.